Speaker of Iranian parliament expressed a desire to finance families of terrorists during anniversary of Iranian revolution. A delegation of Palestinian terror organization representatives met with Speaker of the Iranian Parliament (the Islamic Consultative Assembly) Ali Larijani on Saturday. Members of the delegation included representatives from Hamas, Islamic Jihad, and Fatah who were invited to participate in the 37th anniversary of the Iranian revolution. 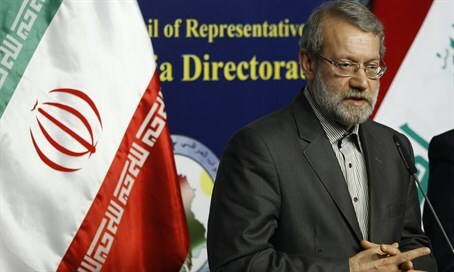 Various news reports on Iranian media outlets have relayed that Larijani expressed a desire on behalf of Iran to give financial aid to the families of terrorists who committed attacks against Israelis and were killed in the process of what he termed as the al-Quds intifada. The financial aid is meant to help those whose houses were destroyed by Israel as a punishment for aiding and abetting the terrorist. U.S. President Barack Obama admitted, during an interview with the BBC in July of 2015, that the removal of sanctions on Iran by the international powers following the P5+1 nuclear arm agreement, will allow Ian to increase its support of Palestinian terrorists and their families. Larijani was a former officer in Iran's Revolutionary Guard, and has served as a former deputy minister and Minister in several posts. He was a security adviser to Supreme Leader Ayatollah Ali Khamenei in August 2004.